Restringing pearls is an art learned over many years and many thousands of necklaces. Harriet Whinney Pearls use traditional, full knotted restringing to refresh, restore and preserve the life and quality of your pearls. We recommend restringing pearls every two years if you wear your pearls regularly. 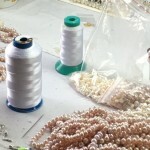 Our professional stringer, knotting by hand, places an evenly sized knot between each pearl while handling multiple strands of silk and pearls. Each item is treated with a great deal of care so that you receive back a beautiful, perfectly balanced piece of jewellery. The overall design needs to be retained while the order can be re-sorted if requested. The tiny drill holes in the pearls are examined to ensure the correct size threads. Restringing requires cool hands and a calm manner to keep the tension and focus constant throughout the process. We finish our hand strung necklaces with fine French wire called gimp which links the pearls to the clasp. You can bring your pearls to us at one of our shows or send them securely to us at our workshop. When posting your pearls to us, please choose the INSURED Royal Mail option. Pack jewellery items securely using a new padded envelope as pearls may burst through normal paper envelopes when under pressure from franking machines. We recommend you have your parcel weighed as insufficient postage delays delivery by weeks. Use the Royal Mail Insured Special Delivery for the safest delivery. Use Royal Mail Signed-For with tracking (uninsured) for inexpensive items only. Enclose your contact details with a brief note about the restringing or repair needed. We will call you to discuss options, arrange the return delivery & take payment. Are threads stretched, broken or discoloured? Has the French wire (gimp) oxidised to green or black? Is the clasp easy to handle? Does it work properly? If you have lost an earring, we will try to match the size, shade, hue and lustre of the original pearl. If we can’t match it perfectly, we will contact you with a description and price of the closest pair available. If your pearl earring has detached from its setting, we can repair and reset it. Please send us the pair as we will reset and check the setting of the other earring too. If your clasp has broken, we can replace it with a secure clasp to match your pearls. Please note that as our clasps have soldered rings, replacing a clasp means that we need to restring your pearls first to secure the clasp. Traditional clasps for necklaces and bracelets can take time to fasten. If you would like to replace these, we supply a range of easy-to-use magenetic clasps which take seconds to fasten and are very secure. Contact us for more information. 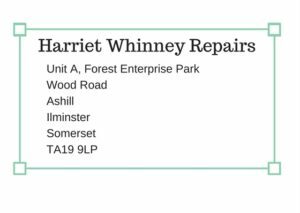 Please note that Harriet Whinney Pearls re-stringing is guaranteed for 12 months. We will contact you with a full quotation on receipt of your pearls. 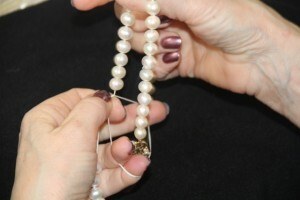 PEARL NECKLACE: Standard restring, 18 inch, single row, fully-knotted. PEARL BRACELET: Standard restring, 8 inch, single row, fully-knotted. Tiny pearls, seed pearls or faux pearls are quoted according to length, size of pearl, size of drilled holes and labour. When posting us your pearls, we strongly recommend that you use the INSURED Royal Mail service.